Samsung may just be about copying everything Apple can throw at it, but a new study shows that even in the manufacturers home country, Apple’s marketshare is growing and is currently at 14 percent. That works out to one in every seven mobile devices being an Apple device right where Samsung live. The news comes as a result of figures obtained by analyst firm Flurry who recently looked at the mobile market in South Korea. Flurry found more than 33 million active smartphones and tablets in the country, and of those Apple’s iOS platform accounted for 14 percent of these. Obviously the most preferred device in the country was the countries own manufacturer Samsung who hold a 60 percent share of the mobile device market, followed by LG who account for 15 percent. Pantech, another South Korean firm came in with just 10 percent fo the market. What’s interesting about these numbers is that even in Samsung’s backyard Apple is growing strongly, even beating out some of the home-grown exclusive manufacturers to South Korea. 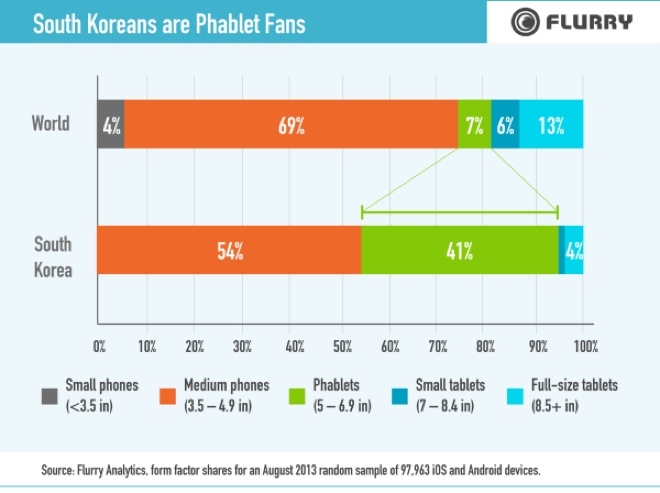 Furthermore, the study also found that phablets were remarkably popular in South Korea; whereas phablet’s account for only 7 percent of mobile devices worldwide, they account for 41 percent of Android and iOS devices in South Korea. Phablets are so popular in fact that they seem to be affecting the tablet sales. Flurry noticed that while tablets account for 13 percent of worldwide devices, they account for only 5 percent in South Korea. 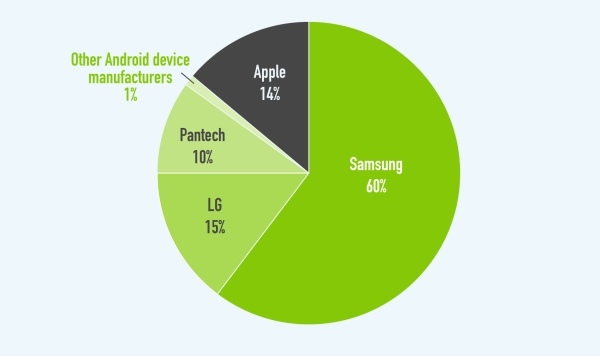 It’s these numbers that might explain why Apple only account for 14% and Samsung and LG are flourishing. It could be because they are more popular with the South Korean population, but it is most probably because Apple do not offer a phablet device, and as such are not as desirable as manufacturers that have such products. However, it seems that no matter what country you are in, Apple are marking their mark slowly but surely.